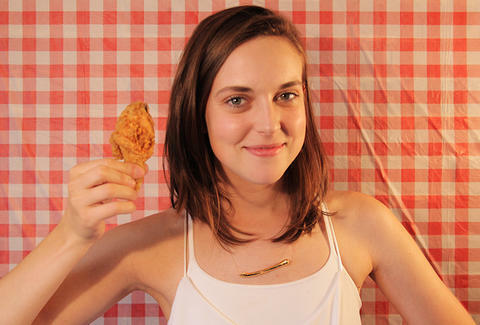 Offering up the perfect gift for that special somebody who is also really into Southern colonels and having dead stuff around her neck, today the folks at Kentucky For Kentucky began selling limited-edition, gold-plated chicken bone necklaces. The jewelry is forged not from chickens with Wolverine's skeletal structure, but from the remains of an actual KFC 8-piece chicken dinner, which were cleaned, dried, and given the Midas touch. We'd recommend presenting one to your potential mate while bathed in the glow of Kentucky For Kentucky's fried-chicken candles and a drumstick corsage. You know, for romance. Andy Kryza is a senior editor on Thrillist's food & drink team. If you would go out with him, he'd give you a silver-plated cow's spleen. Why won't you go out with him?! Follow him to lonely, but well-fed, weekends via @apkryza.